Pollution levels are orders of magnitude higher in lower-income countries than in the developed world. This means that studies of the health effects of pollution based on data from the latter will not necessarily be relevant to the former. This column reports on the effect of air pollution on infant mortality in Mexico City. Significant effects are found that are much larger than found in earlier work based on US data. These findings highlight the potential pitfalls of naively extrapolating findings from high-income to developing countries. To inform policy choices in developing countries, people often turn to economics papers from developed countries and extrapolate these findings. This is in part due to the fact that much of the empirical economics literature is focused on the developed world. For example, Das et al. (2013) document that out of the 76,046 empirical economics papers published between 1985 and 2005, 48% focused on the US, despite the country having only 4.5% of world’s population. Another 14% of papers covered Canada and the UK. In contrast, 3.8% of the papers were focused on either China or India, despite these two countries having 37% of the world’s population. While studies of the US can help change our perspective about what can or cannot work in developing countries, they may not necessarily be a perfect substitute, given the different contexts and institutional structures. We have increasingly seen examples where policies that work in developed country settings are not necessarily transferable to developing country settings – for example, the neonatal resuscitation programme trial (Waldemar et al 2010) or the debate about class size (Angrist and Lavy 1999 for Israel versus Duflo et al. 2015). To this end, we became very interested in understanding the causal impact of different pollutants on health and infant mortality in developing countries and comparing these estimates with those from the literature derived from developed country settings (e.g. Currie and Neidell 2005, Greenstone and Chay 2003, Knittel et al. 2012, Currie et al. 2009). Theoretically, it is not clear that estimates from the US will translate to developing country settings, despite the fact that one may ex ante assume that the relationship between pollution and health outcomes is a scientifically determined one, regardless of location. First of all, the levels of pollution are orders of magnitude higher in developing countries than in the US. 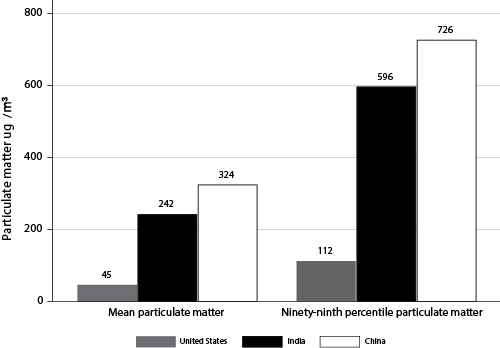 For example, Greenstone and Hanna (2014) highlight that India’s ambient particulate matter concentrations levels are five times higher than the US, while China’s are nearly seven times the US level (see Figure 1). In fact the mean level for India is nearly double the 99th percentile for the US, while China’s mean is nearly triple that—in short, the typical pollution someone in a developing country faces is much worse than abnormally bad days in the US. This implies that studies in the developed world will not capture the relationship between pollution and health outcomes at the levels typically seen in developing countries. This is especially problematic if the response of health to pollution increases changes at higher levels (i.e. it is non-linear). For example, if pollution is more detrimental at higher levels, by using the estimated response from studies in the developed world we would be understating the damage that families face. On the other hand, if there is a salient level that pollution needs to fall beneath before policies that reduce pollution have an effect on health, using developed country estimates could alternatively lead us to overestimate the effect. Second, how individuals ‘cope’ with pollution may differ across the two contexts, given differences in information and income levels. For example, in the US context it has been demonstrated that the effect of pollution on health is dependent on one’s behaviours (e.g., Neidell and Moretti 2011, Deschenes et al 2012). Given that there is less clear data on pollution in developing counties, it is possible that people do not have the right information to properly make decisions about how to protect themselves. Moreover, with lower incomes and less access to health care, many may lack the ability to protect themselves. For example, if pollution has a larger effect on those who are already sick, the effect in developing countries may be larger than in the US since overall health status is lower. Therefore, in new work, we were motivated to estimate the effect of pollution on infant mortality in a lower-income country (Arceo et al. 2016). We focused on Mexico City, taking advantage of the fact that it has both good measures of pollution and of infant mortality. Note that Mexico City also experiences both the high levels of pollution and of infant mortality that are common in many developing countries and thus can provide a good proxy for them. Estimating this relationship between pollution and mortality is challenging to do because we need to separate out the effect of pollution from other factors (e.g. income levels) that could also affect both pollution and health. Therefore, we exploit a meteorological phenomenon known as thermal inversions (Figure 2): “An inversion occurs when a mass of hot air gets caught above a mass of cold air, trapping pollutants. Conditional on temperature, inversions themselves do not represent a health risk per se other than the accumulation of pollutants.” Therefore, we can see how pollution that is driven by these inversions drives infant mortality. Using this strategy, we find robust evidence of pollution on infant mortality. For example, our estimates imply that 1µg/m3 increase in 24-hour particulate matter (PM10) results in 0.23 weekly infant deaths per 100,000 births. Similarly, a 1ppb increase in the 8-hour maximum for carbon monoxide results in 0.0046 weekly deaths per 100,000 births. The results imply that the reductions in air pollution that environmental policy in Mexico City accomplished between 1997 and 2006 saved approximately 308 infant lives per year. We next separate deaths into those that are likely to be pollution related (e.g. respiratory and cardiovascular disease) versus those that are less likely to be pollution related (digestive, congenital, accidents, homicides, etc.). We find statistically significant effects of pollution on infant deaths from respiratory and cardiovascular disease, but none on deaths from those less likely to be pollution-related. This reinforces the idea that we have isolated the effects that are simply due to pollution, and not to other factors, such as income. Comparing our estimates with those typically generated by US data, we find much larger effects of carbon monoxide on infant mortality (as compared with Currie and Neidell 2005, and Currie et al. 2009). However, our results for PM10 are very similar to those from Chay and Greenstone (2003) despite the fact that the mean level of pollution in their setting is about half of that in Mexico City. Thus, aggregating all of this together, if we used the US policy estimates to make predictions about the benefits of policies that reduced pollution in developing countries on health, we would have underestimated some of the impacts. In short, there has long been a debate on whether we need additional research in developing countries when there is already evidence from the US. The question of increased and better knowledge versus ethical concerns to act quickly will likely not be resolved anytime soon. But, it does speak to the fact that more research specific to low-income countries needs to be conducted in conjunction with research on high income countries, rather than allowing research from higher income countries to continue to dominate the policy debate. Althabe, F, C Bose, P Buekens, W A Carlo, Chakraborty, E Chomba, R Derman, et al (2010) “Newborn-care training and perinatal mortality in developing countries”, The New England Journal of Medicine, 362: 614-623. Angrist, J and V Lavy (1999) “Using Maimonides’ rule to estimate the effect of class size on scholastic achievement”, The Quarterly Journal of Economics, 144(2): 533-575. Arceo, E, R Hanna and P Oliva (2016) “Does the effect of pollution on infant mortality differ between developing and developed countries? Evidence from Mexico City”, Economic Journal, 126(591): 257-80. Chay, K and M Greenstone (2003) “The impact of air pollution on infant mortality: Evidence from geographic variation in pollution shocks induced by a recession”, Quarterly Journal of Economics, 118: 1121-1167. Currie, J and M Neidell (2005) “Air pollution and infant health: What can we learn from California’s recent experience?” Quarterly Journal of Economics, 120: 1003-1030. Currie, J, M Neidell and J Schmieder (2009) “Air pollution and infant health: Lessons from New Jersey,” Journal of Health Economics, 28: 688 – 703. Das, J, Q Dom, K Shaines and S Srikant (2013) “US and them: The geography of academic research”, Journal of Development Economics, 105: 112-130. Deschenes, O, M Greenstone and J Shapiro (2012) “Defending against environmental insults: Drugs, emergencies, mortality and the NOx Budget Program Emissions Market”, Working Paper. Duflo, E, P Dupas and M Kremer (2015) “School governance, teacher incentives, and pupil-teacher ratios: Experimental evidence from Kenyan primary schools”, Journal of Public Economics, 123: 92-110. Greenstone, M and R Hanna (2014) “Environmental regulations, air and water pollution, and infant mortality in India”, American Economic Review, 104(10):3038-3072. Knittel, C, D L Miller and N J Sanders (2011) “Caution, drivers! Children present: Traffic, pollution, and infant health”, NBER Working Paper No. 17222. Moretti, E and M Neidell (2011) “Pollution, health, and avoidance behaviour: Evidence from the ports of Los Angeles”, Journal of Human Resources, 46: 154–75.